Yesterday we harvested what may be the last of our tomatoes and basil leaves. And we decided there was no better way to celebrate summer’s approaching end and our first successful (and humble) garden than with homemade pizzas. 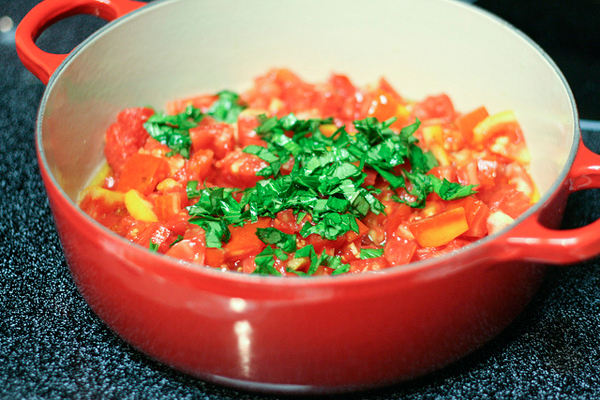 Nick stewed a sauce of tomatoes, basil, red onions, garlic, salt, and pepper. And I know I’ve said this before, but it’s worth saying again: You haven’t tasted a tomato until you’ve had one ripened on its own vine by the sun. It’s hearty, juicy, sweet, and tangy. 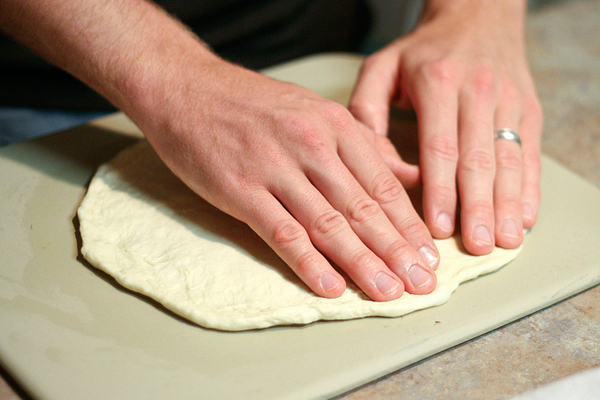 Then Nick rolled out the dough, and I pricked it with a fork and sprinkled it with pizza sea salt (thanks Mom and Dad Wiley!). While Nick continued to stir the red sauce for one pizza, I made a green one for the other. 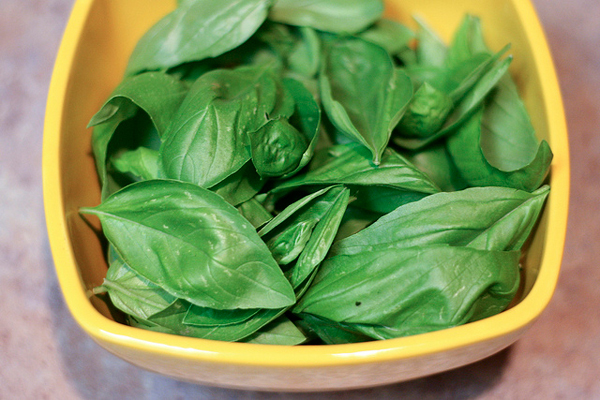 Why, oh why, did it take us so long to turn our basil into pesto? 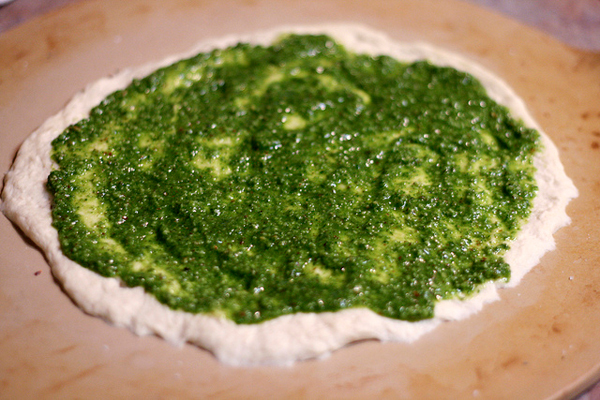 Traditional pesto uses pine nuts, but we didn’t have any on hand, so we substituted toasted almonds. 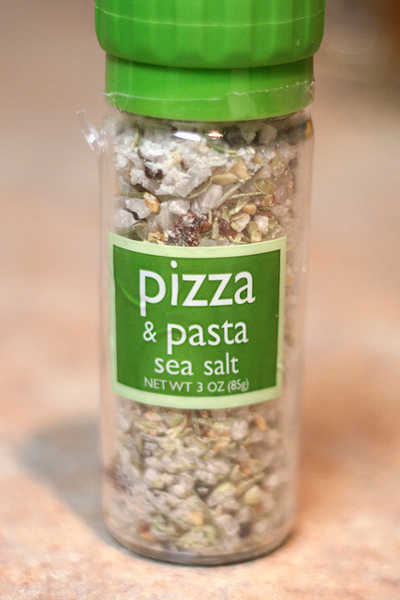 We combined the basil, almonds, garlic, Parmesan cheese, extra-virgin olive oil, salt, pepper, and nutmeg (yes, nutmeg!) in the food processor until a coarse paste formed. 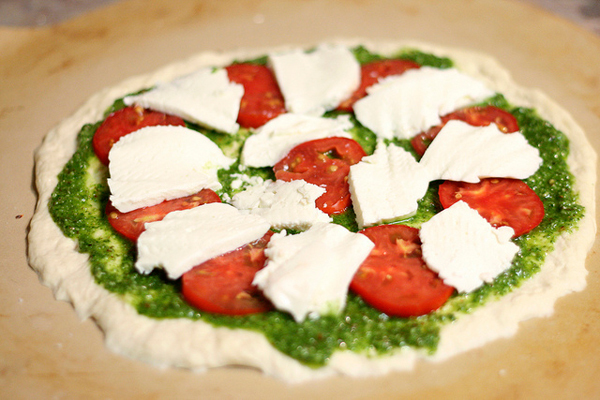 I topped the pesto pizza with sliced tomatoes and chunks of mozzarella cheese. And Nick covered the stewed tomatoes with shredded Italian cheeses, peppers (also from our front porch garden), and pepperoni. 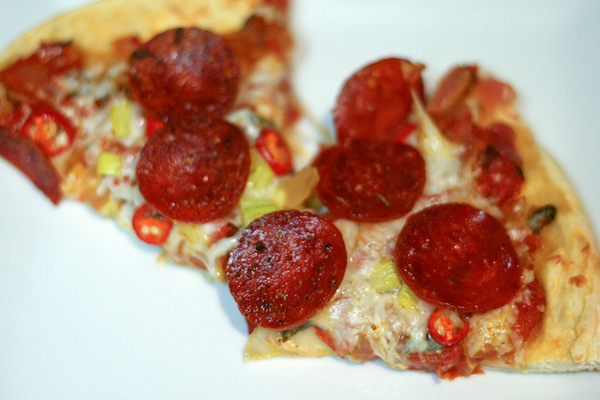 In just 20 minutes, we had hot, delicious homemade pizzas. 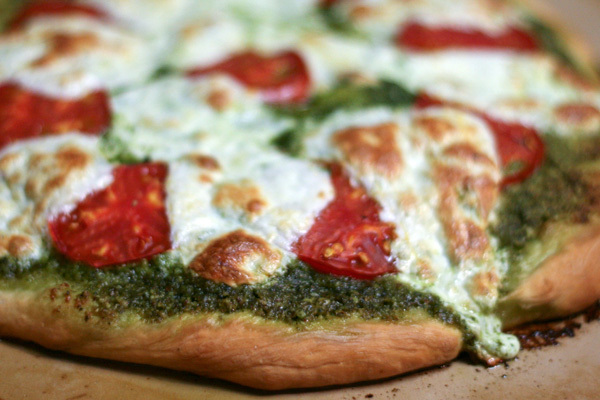 The pizza with stewed tomatoes was tasty, but we both agreed the pesto pizza was the star of the night. How are you using up the last of your summer produce? Toast almonds in a small skillet over medium heat for about 5 minutes, stirring occasionally to prevent burning. In a food processor, combine toasted almonds, garlic, basil, cheese, extra-virgin olive oil, nutmeg, salt, and pepper. Process until a coarse paste is formed. They look delish, I’m jealous of your fresh produce. That’s my goal next summer. Wow! I’m making this most definitely! Looks so tasty! Oh my gosh, this looks amazing! 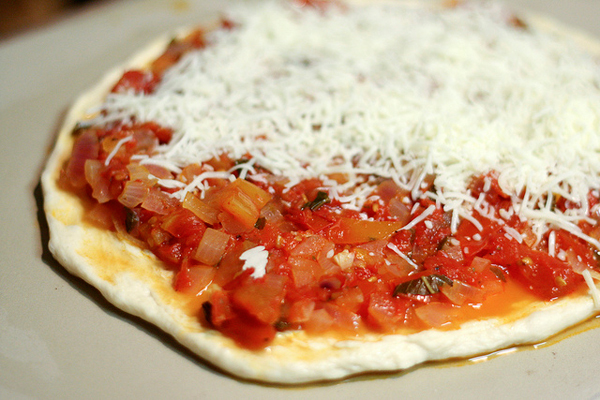 Isn’t homemade pizza the best? I don’t know if I can go back to the delivery stuff! I’m thinking I want to do a container garden. We have a little plot behind our townhouse, but our neighbors are idiots and let their dogs run free. 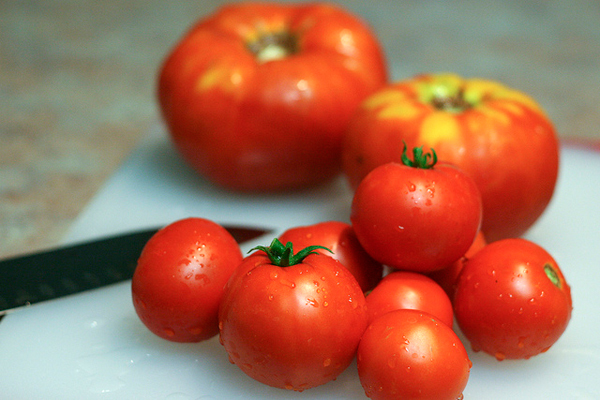 If you are thinking tomatoes for a container next year, look for varieties that are “determinate”. That means they won’t vine and grow really tall. No tomatoes over here, but SO MUCH basil. I need to ramp my pesto production for the freezer back up again. I don’t think T and I have ever made homemade pizza together … this is just the thing to jumpstart it! Probably will be getting some more tomatoes, although not sure what variety. Looks great. Note the reviews. It is amazing, the taste goes beyond a tomato. White tomatoes? Sound really good, Jamie. Do you order all of your tomatoes from seed? I’ve never done it, but I’d like to next season.